Utilize that empty space on your bicycle’s frame triangle with a frame bag! Bike frame bags are a convenient and out-of-the-way place to store extra gear on your bike. Bike frame bags can be used in a wide variety of circumstances from local commuting to long distance touring to bikepacking and just about everything in between. The narrow profile of bike frame bags ensures that they are kept out of the way of a rider’s movement on the bike. Their attachment straps are designed not to interfere with the bicycle’s cables and housing. Bike frame bags also have a very minimal impact on a bicycle’s handling, especially when a rider is out of the saddle or cornering. Unlike pannier and bike rack setups, which do tend to change bike handling to some degree, bike frame bags usually go unnoticed by a rider, much like saddle bag. Full frame bags: come in a variety of options and mounting styles, and they are often designed to accommodate the huge range of bicycle frame sizes and styles available today. Brands such as Revelate Designs, on the other hand, make full frame bags to perfectly fit the triangles of specific bike models, and maximize the carrying capacity so that racks and panniers are not necessary. Front frame bags: mount to the front triangle of your bicycle’s frame where the down tube and top tube come together. Non-custom full frame bags usually come in different sizes to fit your bicycle’s frame, and they generally don’t fill the entire frame triangle as a custom frame bag might. Most frame bags mount underneath your bicycle’s top tube and provide easy access to the items in the bag both while you in the saddle, as well as when you are off the bike. 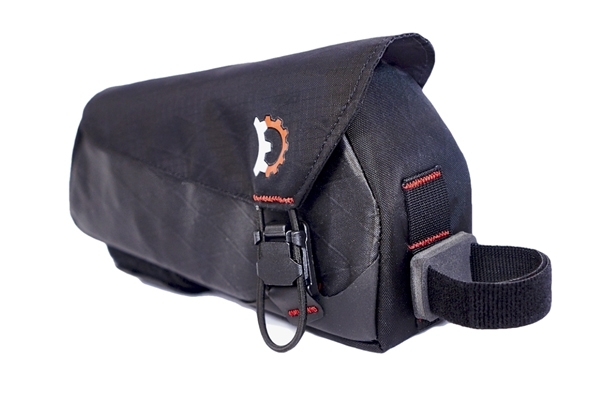 In general, all three types of frame bags provide a unique way to carry more gear, without giving you a sweaty back or changing your bicycle’s handling characteristics. In order to select the best frame bag for your needs, there are a few important considerations. You should decide approximately how much you will be carrying on average, and how you would like to carry the things you need. Chances are, you will be using the frame bag to supplement other bike bags, such as a saddle bag, bike backpack, pannier, and more. If that is the case, how much you will be putting in the frame bag? The amount of gear you plan to put in the frame bag will dictate whether you need a full frame bag, or just a front or rear frame bag. When you are choosing between a front or rear frame bag, you might check to see if one or the other will work when you have a water bottle cage installed on your bicycle’s frame. This will vary depending on your frame size and design, but you can check the specs on our bags to get a sense of whether a particular bag will work in conjunction with a water bottle cage on your bike. Bike frame bags are a great addition to other bike bag combinations. For example, you can combine a bike frame bag with a bike saddle bag if you only need a little bit of additional space. However, if you are carrying a large amount of gear and have filled up your bike panniers, bike handlebar bags, and bike rack-top bags, a bike frame bag will provide much needed space for those extra items you can’t live without. Bike frame bags are also a great option for bikepacking (ie. off-road bike touring), and they can be paired with a bike backpack for additional gear carrying space for off-road riding. Attachment points: Bike frame bags usually have at least three or four different attachment points so that they will be firmly secured to your frame. Full frame bags may have a variety of attachment options, but they generally attach somewhere on the steering column, the seat post, and the top tube. Straps: Frame bags are attached to your bicycle’s frame with a variety of different strap systems. Most of the straps velcro around your bicycle’s frame tubes and can be adjusted depending on the diameter of your frame. The straps are designed in such a way as to not interfere with your bicycle’s brake and shifting cable and housing system. Adjustability: Most front and rear frame bags can be adjusted, using their unique strap systems, to fit securely on your frame. Full frame bags can also be adjusted, or may come in different sizes, to accommodate different bicycle types and sizes. Size and capacity: Frame bags come in a wide range of shapes and sizes to fit your bicycle and your riding needs. Front frame bags and rear frame bags don’t carry as much as their full frame bag counterparts, but they still make a great addition to a bike backpack or saddle bag, while still leaving some usable space on your frame for a water bottle cage. Full frame bags take up more space on your frame but can haul more than their smaller front or rear cousins. Main compartment: The main compartment of a frame bag is slim and slender, so that when the bag is packed it doesn’t interfere with rider movement. However, the main compartment is a great place to store those essential items you want close at hand, such as a small pump, tools, tube, camera, phone, wallet, and more. 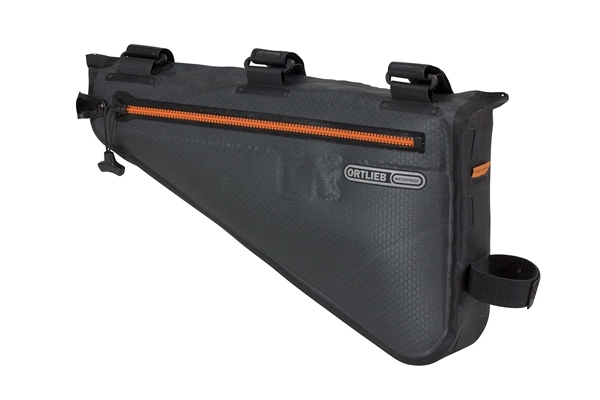 Internal compartments: For extra security and organization, many frame bags have internal compartments and pockets to help keep your gear in its place and stored safely within the bag. Side pockets: When you need easy access to small items, some frame bags have small mesh or zippered pockets on the outside of the bag. Weather resistance and durability: When you have some great riding adventures planned, you want a frame bag that will withstand the elements and accompany you on many additional trips. Reflective features: It’s always good to add some extra visibility to your favorite bike frame bag, and fortunately, most manufacturers already do it for you with built-in reflective elements for riding in low light or at night. Revelate Designs : An awesome assortment of bike frame bags and other delectable bikepacking gear. Apidura : Technically astute framebags and bikepacking equipment. Restrap : A very unique take on framebags and bikepacking gear with hand crafted British authenticity and craftsmanship.